Paris, Bibliothèque Nationale, Ed 3. Pen and ink over black chalk, 30.7 x 22; the sheet is slightly ragged at the left edge and has binder holes indicating that it has been removed from a notebook; wm?. The sheet is stained at the lower left and slightly at the lower right. 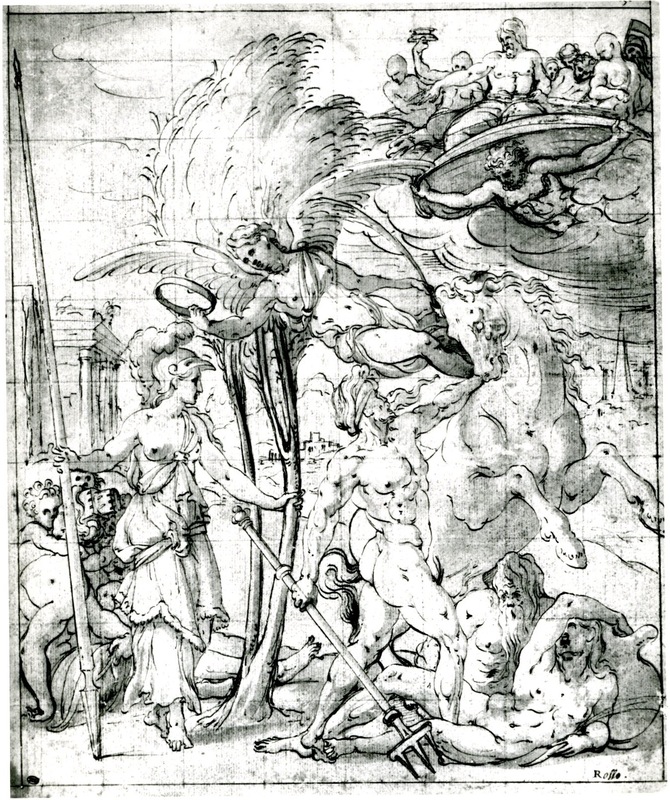 This drawing shows the scene of Poseidon and the horse at the right of Rosso’s composition known from Fantuzzi’s etching (Fig.E.78) and from the engraving attributed to Boyvin (Fig.E.13). But the drawing is in reverse and hence was not copied from these prints. 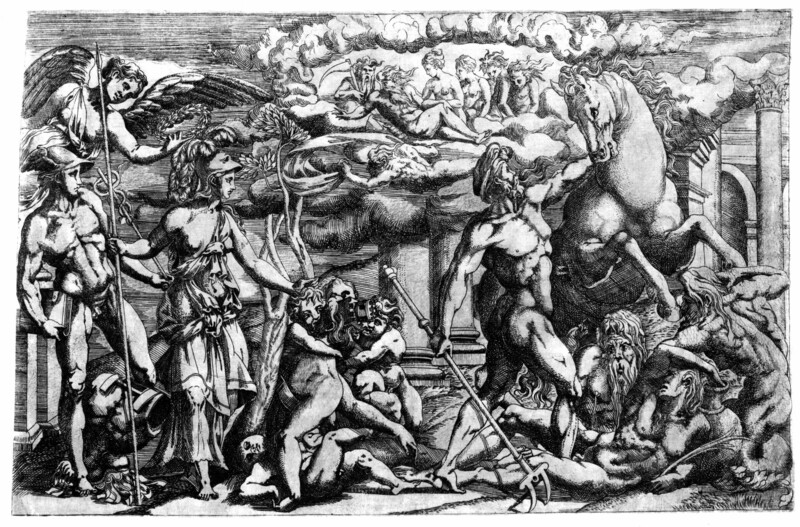 As all of Fantuzzi’s etchings are in reverse of the images from which they are derived, and as Poseidon reaches up to the horse with his right hand in the drawing, the drawing would be in the original direction of Rosso’s composition. The draughtsmanship of the drawing is too awkward and many of its details are too crudely described for it to be by Rosso himself, in spite of the fact that the drawing has a certain graphic vigor. Furthermore, the relation of the pen drawing to such an extensive black chalk underdrawing is not found anywhere in Rosso’s autograph drawings. It should be noted that the bullrushes held by the reclining river god are lightly rendered only in black chalk. While the drawing cannot be by Rosso, its draughtsmanship shows signs of having been derived from a drawing by him. The rhythmic contours of discontinuous lines and the patches of small parallel lines to describe muscles are very similar to what appears in Rosso’s Pandora and Her Box (Fig.D.67a). However crude the drawing may appear in comparison to that autograph work, it would seem that the Contest of Athena and Poseidon was copied from a lost drawing by Rosso. In fact, the vigor of the copy seems dependent on a kind of personal imitation of the type of penmanship found in the Pandora and Her Box. It is, however, likely that the original drawing had washes like that drawing. The drawing is much more closely related to Fantuzzi’s etching than to the engraving attributed to Boyvin. 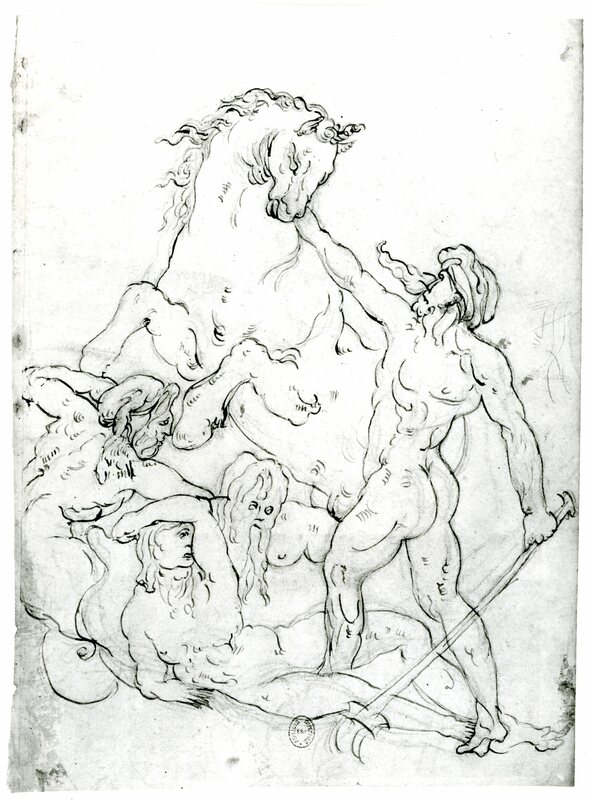 As in the etching, the triton at the far left has flowing hair and the horse’s tail is not shown. Also, the hair blowing forward in front of Poseidon’s face is abundant, as in Fantuzzi’s print. The profile of the triton is much more as it is in the etching and the river god turns his head and covers his face as in this print. It should also be noted that the urn against which the river god leans has a curving profile, more as in the etching than in the engraving. It would seem, then, that the lost drawing from which this partial copy was made was the model for Fantuzzi’s etching. As the copy shows only part of the scene, it could have been made from a drawing only of this section that was known to the copyist. 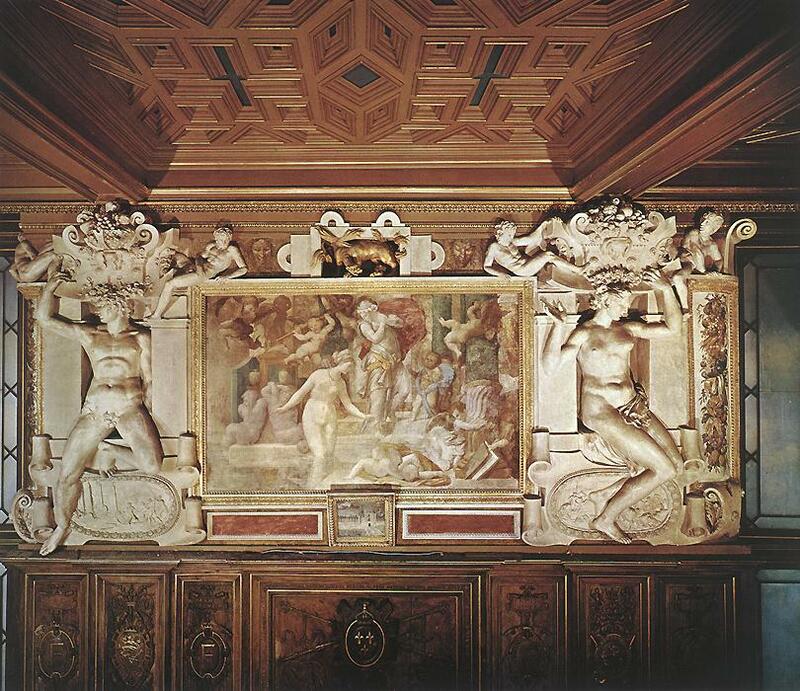 The active figures in the complete scene, and its planar, energetic composition, so closely resemble those of Rosso’s Pandora and Her Box that it would seem that they were invented about the same time, around 1536. This is also suggested by the draughtsmanship of the copy. Joannides’s suggestion (see below, VARIATION AND PARTIAL COPY) that Poseidon and the horse seem to have been invented by Rosso in Rome may indicate only the extent to which Rosso brought his visual vocabulary with him when he went to France, although the figures mentioned do not, in their especially energetic poses, specifically recall any of Rosso’s Roman inventions. They seem to have been conceived in France for this particular picture. It is possible that the original drawing was made to have a place on the East Wall of the Gallery of Francis I and an iconographical relationship with the Enlightenment of Francis I (Fig.P.22, VII S a) and the Venus and Minerva (Fig.P.22, I N a), on which see Chapter VIII, P.22, E.13, and E.78. PRINT: E.78, Fantuzzi (Fig.E.78). Reversed etching probably based on the lost original of D.66. VARIATION AND POSSIBLE PARTIAL COPY OF A RELATED LOST DRAWING: Paris, Louvre, Inv. 8738 (Fig.Paris, 8738). Pen and ink and wash heightened with white on tan paper, squared in black chalk. Inscribed in ink at the lower right: Rosso. PROVENANCE: Saint-Morys. LITERATURE: Kusenberg, 1931, 150, no. 23, as a partial copy of Rosso’s composition after the lost original or after the prints of Boyvin and Fantuzzi. Béguin, RdA, 1965, 105, as a mediocre and partial copy of Fantuzzi’s etching. Saint-Morys, 1987, II, inv. no. 8738, giving Morel d’Arleaux’s (522) attribution to Rosso. Joannides, 1994, 233, 236, Fig. 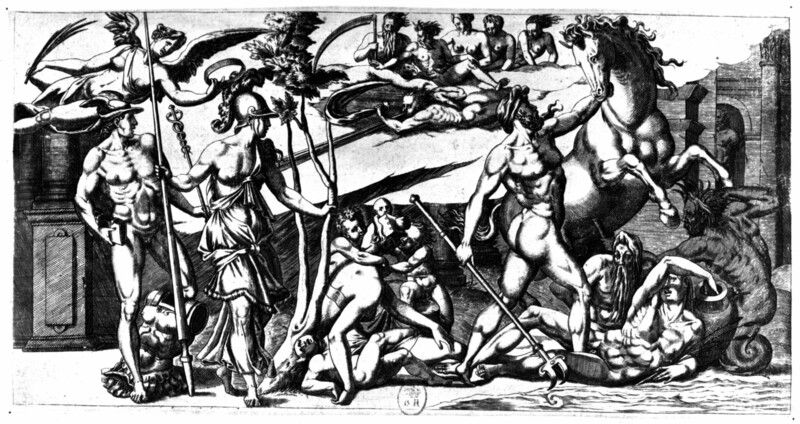 7, 246, n. 9, as an abbreviated copy of Rosso’s Dispute Between Poseidon and Minerva, the figures of Poseidon and the horse appearing to have been invented by Rosso in Rome rather than in the 1530s, the reclining figure below Poseidon from the lower right corner of Donatello’s Lamentation of the north pulpit in S. Lorenzo in Florence. Boorsch, 1994, 238, under no. 39, as a partial copy of Fantuzzi’s print. This drawing, given to the School of Fontainebleau in the Louvre, shows Rosso’s composition as represented in the prints but compressed into an almost square format. The figure of Hermes is missing, as is the triton, and the personification of Athens, without the child sprawled on the ground, is placed at the far left rather than between the two episodes depicted in the original composition, and Victory is seen in the very center rather than at the side. The background is different from its appearance in the prints, the scene of the gods in the sky is not the same, and the olive tree is much larger to fill the greater height of the scene. In general, the figures are in the direction of those in the prints, except for Victory, who is reversed. She is shown complete as in the print attributed to Boyvin and the band she holds is the simple one, without leaves, that appears in that print. In general, it would seem that the drawing was derived from the engraving given to Boyvin, except that one detail contradicts this conclusion: the broad lipped urn behind the river god is almost identical to that in D.66, which is also unlike that in Fantuzzi’s etching. The drawing also shows a draughtsmanship that depends on Rosso’s, especially in the description of the large figures. 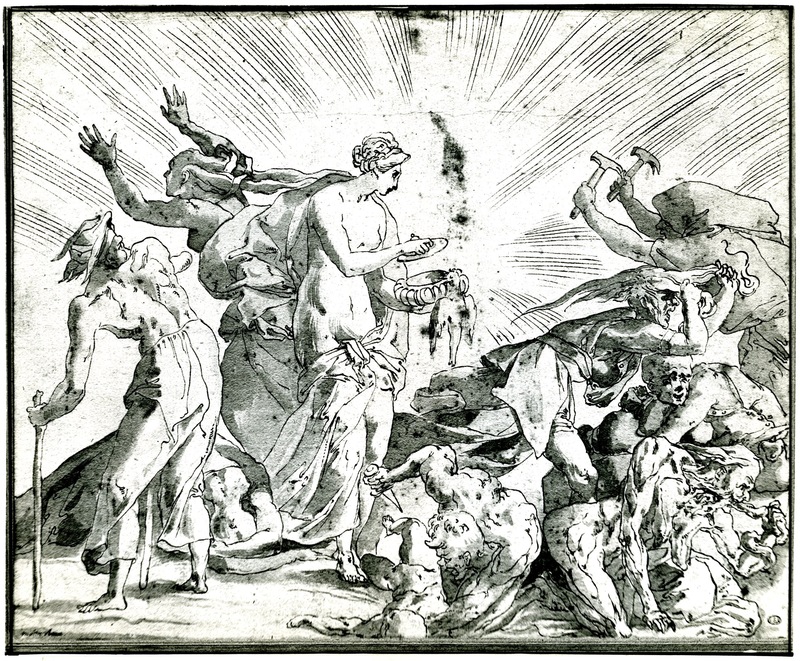 Also, some of the figures around Zeus in the sky have bald heads, as appears in some of Rosso’s drawings. But it is not clear why, if this drawing is dependent on a lost drawing, the same one, perhaps, from which the engraving attributed to Boyvin is derived, it is in reverse of that drawing. 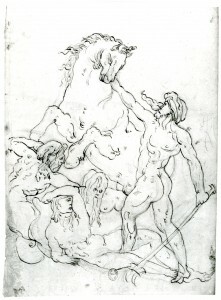 In any case, it is possible that the drawing bears some relation to a lost drawing by Rosso, although probably not directly the original of D.66.